The annual Just Nuisance Day has long been an institution on the Simon’s Town social calendar. This year’s event promises to be bigger and better than ever, with leading dog food brand JOCK coming on board to celebrate the legendary Great Dane’s birthday on 1 April. Through association and endorsing of the Just Nuisance Dog Walk, JOCK Dog Food aims to promote the celebration of the four-legged legends of South Africa. Involving the non-profit dog rescue organisation TEARS, JOCK will help make this fun family event something that dog lovers from all over the Western Cape and visitors won’t soon forget. JOCK will also be contributing R20 000 to the TEARS “Pimp My Kennel” campaign and donate a total of 1 ton of dog food prior to Just Nuisance Day. This annual event is named after Just Nuisance, the giant Great Dane with a larger than life personality and the first dog ever to be officially enrolled in the Royal Navy. With JOCK’s payoff line “Unleash your inner legend”, the historical and heroic story of Just Nuisance is a perfect fit for the JOCK brand and associating with this annual event affords the brand an exciting opportunity to celebrate all the four-legged legends in our country. Various competitions and a lucky draw will take place while the naval marching band and canine unit keeps the crowd thoroughly entertained. For a small fee, well-known dog photographer Dog Meet Girls will be available to take exquisite portraits of any dog willing to pose in the pop-up studio, with 10% of the proceeds donated to TEARS. The involvement of TEARS Animal Rescue as beneficiary is perhaps the most inspiring element of this year’s Just Nuisance Day. All proceeds from the event will go towards their “Pimp My Kennel” campaign to upgrade their facilities. On the day, TEARS will also be bringing some of their rescue dogs along for dog lovers who find themselves in Simon’s Town without a pooch to take on their favourite activity – a walk. For JOCK, the collaboration with Just Nuisance Day is a match made in heaven. “As a brand that’s all about celebrating the canine legends in our lives, getting involved in Just Nuisance Day is the perfect platform for JOCK to reach out to the dog-loving public. We’re delighted that this can help TEARS to raise funds to continue the amazing work they do all year round,” says JOCK marketing executive Liezel van Bergen. The event will take place on 1 April from 11h00 to 15h00 at Jubilee Square, Simon’s Town, and is open to everyone. There will be no entry fee for participating in the JOCK Just Nuisance Dog Walk. 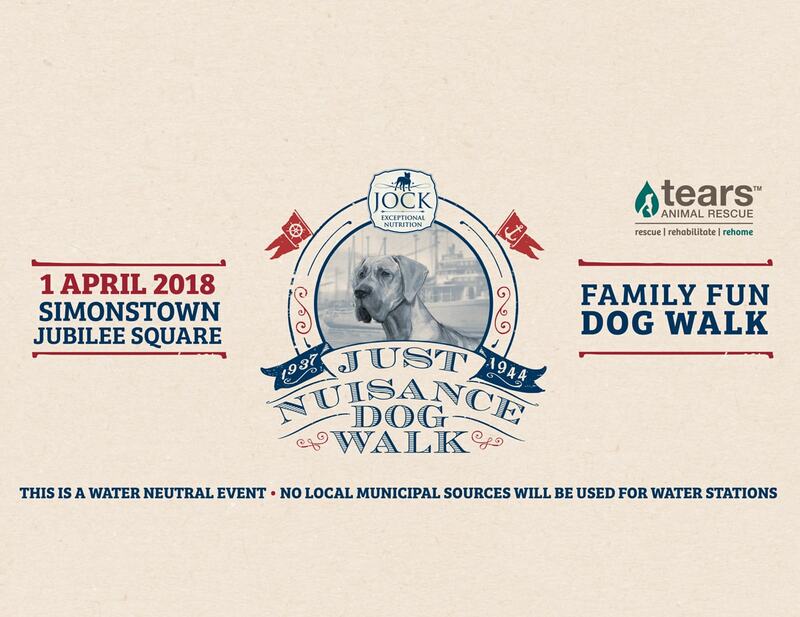 JOCK Dog Food is very respectful of the current water crisis in the Western Cape – the event will therefore be water-neutral with no municipal water used. Based at the Simon’s Town naval base between 1937 and 1944, Just Nuisance was bestowed with the honours of Able Seaman. This remarkable dog was a constant presence in and around Simon’s Town, regularly boarding trains and lifting the morale of wartime sailors — even escorting inebriated sailors back to the naval base after a night out. So popular was this dog, that he was buried with full naval honours when he passed away. JOCK maintains quality systems of the highest standard at our ISO 9001 certified plant in Isando, Johannesburg. All products go through strict quality procedures, including water activity measurements, in-line metal detection and final product inspection on the NIR of protein, moisture, fat and pellet quality. Raw materials and finished products are tested monthly for Mycotoxins, and specifically Aflatoxin, while strict cleaning programmes and Salmonella monitoring further ensures raw materials and production lines hold no contamination risk. JOCK Dog Food is a brand owned by AFGRI Animal Feed, a division of Philafrica Foods (PTY) Limited. Follow JOCK on Facebook for news and legendary four-legged stories from South Africa. TEARS Animal Rescue (The Emma Animal Rescue Society) is one of the country’s leading organisations. Its mission is to rescue, rehabilitate and re-home domestic animals as well as providing veterinary services to local communities. As a pro-quality of life, registered, non-profit organisation, TEARS relies on the support of caring individuals and corporates to assist them in fulfilling their mission to bring relief to animals in distress, whether through intervention, education, medical assistance or rehoming. TEARS is in the False Bay area of the southern Cape Peninsula and they typically serve the communities of Ocean View, Masiphumelele and Red Hill, Mountain View, Capricorn, although TEARS also assist animals and guardians throughout the Western Cape when their services are needed. Well-known dog photographer Shannon Sweetman, known as Dog Meets Girl will also set up her pop-up studio to take exquisite portraits of any dog willing to pose. The Dog Meets Girl brand is a Lifestyle & initiative which helps dogs in need! Dog Meets Girl will donate 10% of her earnings on the day to TEARS. JOCK branded Goodies bags will be available for the first 400 registered dog lovers on the day — the goodie bag will contain a buff for the dog owner and bandana for the 4-legged legends participating in the walk. Poop bags will be provided. The South African Navy Band, the premier band of the South African National Defence Force will open and lead the dog parade.